Colorado’s economy is, by almost any measure, red hot. Job growth, business formation and wages all are up. But even the most robust economy doesn’t serve everyone. Hidden in the averages are frustrated workers and companies. Nancy Profera is one of them. That bite didn’t lead anywhere. Profera moved here in 2017 from California and has been living on savings as she hunts for gainful employment. She says it’s been frustrating just how impersonal the experience is these days. She had a job interview where questions flashed on her computer screen, and her responses were recorded through the camera. There was no human on the other end. She didn’t make the next round of candidates. When she eventually got to a real-life person, she asked how many got to the next stage, figuring it was between three and seven. “They had done 20 people,” Profera said. 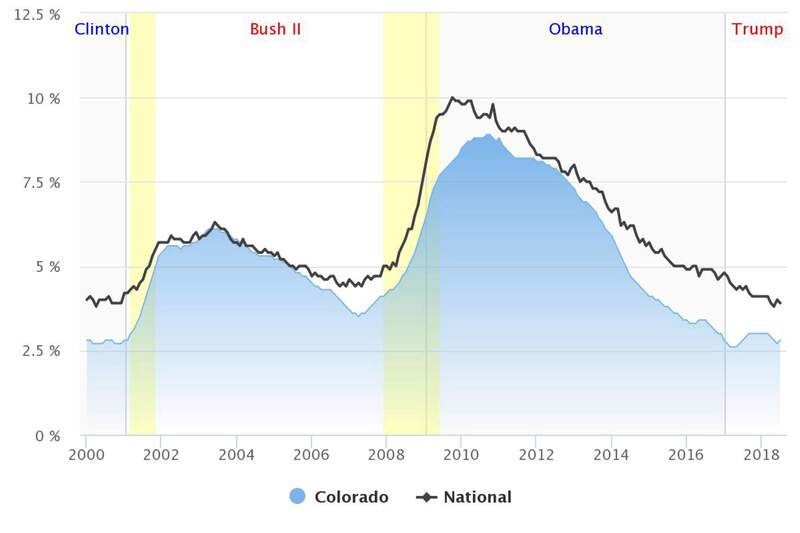 Month-to-month unemployment rate in Colorado from 2000 to present overlapped with presidential terms. Yellow vertical bands denote U.S. economic recessions. But there’s something else she’s up against. Profera is, by official measures, a member of the long-term unemployed. Out of the workforce for 27 weeks or longer. Martin Shields, an economist with Colorado State University, said research shows the longer people are out of work, the harder it gets to find work. “Your networks wash away, it’s hard to get back into the job market,” he said. And it should be the most welcoming job market ever. Employers rank the shortage of workers as their top concern in surveys. The state’s unemployment rate has been at or below 3 percent for almost two years now, one of the lowest rates in the nation. “With the great shortage of workers that we have in the country and in the state, it’s just really surprising that we don’t see these people finding something that’s suitable,” said Richard Wobbekind, economics professor at the University of Colorado Boulder. He expected the state’s economy to slow because there weren’t enough workers to fill jobs, but surprisingly, wages and salaries are going up just enough to bring people back. “Potentially, we’re generating enough higher-quality jobs that some of the people who have been on the sidelines, who have lost high-paying jobs, are finally saying, ‘you know, this is worth getting back into the labor force’ – we’re at a threshold just in terms of salaries,” Wobbekind said. The percentage of people working, or seeking employment, has risen substantially in Colorado, especially compared to other states, from a low of 66.6 percent in 2015 to 69 percent now. That’s helped employers fill jobs. However, finding skilled workers in some professions, like construction or health care, remains a major challenge. Miranda Hutchison, a dentist who runs Station Dental in Aurora, was on a quest for a dental hygienist for five months. She’s often on social media groups for dental professionals. “You’ll have one hygienist put in an application, ‘Hey, I’m moving to Colorado,’ and you’ll see 40 dentists like throwing themselves at this person, like, ‘Hey, we need someone,’” Hutchison said. Colorado is a hygienist desert. Miranda’s husband, Brad, who is also her business partner, said they’ve had to increase their benefits to attract talent. “We’ve recently introduced a 401K, so that’s our first step along those lines,” Brad said. Besides the benefits, higher pay is another way to attract skilled labor. Wages have been rising in Colorado generally, up 3 to 4 percent in 2018 over the previous year, according to data from the state Department of Labor and Employment. The attraction of higher wages poses a challenge for government and municipal employers, who have to get creative to bring on enough employees to maintain their services. No matter how good the economy seems on the surface, some people and businesses will be left out, whether it’s the long-term unemployed or businesses in specific sectors desperate for skilled workers.